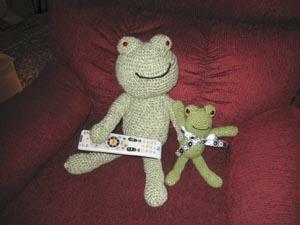 Learn more about using crochet skills for Amigurumi. Crochet, it seems, is a relatively modern craft, though authorities still debate whether the craft began in the 16th century or the 19th. Either way, it's a recent invention compared to knitting, embroidery and weaving. No one knows exactly when crochet started, and they don't know where, either. Some say it came from Arabia, some from China, others from South America. Still others point to European lace work as one of the earliest forms of this craft, but there's no evidence of it there until the 1800s. The South American theory says that the craft was used in puberty ceremonies, while the Chinese were said to use it to make dolls. The popular theory today seems to be that crochet came from China, then traveled to Europe in the 18th century as tambouring, a process by which fabric is stretched tight and the loops are threaded through the background fabric. By the end of the 18th century, the background fabric fell away and crochet as we know it today was developed. In the 1800s, with the development of more widely available printed materials, crochet patterns began to be printed and distributed, spreading the craft around Europe. In those days, crochet hooks were made of ivory, brass, bone and wood instead of the plastic and metal hooks we know today. The Irish version was also coming on to the scene in the 1800s, and lace production was a huge industry during the potato famine in the mid-1800s. Filet crochet became the traditional version of the craft in Greece. While crochet fell out of favor during the wars, it resurged in the 1970s as crocheted items were very fashionable. Today, it's coming back again and is known as a popular and versatile craft. While still not quite as popular as its cousin, knitting, which has enjoyed a resurgence in the past few years, crochet is emerging as another cool and portable craft.